It’s reported that Winston Churchill once said, “A pessimist sees the difficulty in every opportunity; an optimist sees the opportunity in every difficulty.” So how do you turn pessimism into optimism? You likely battle one or the other. So which are you? Are you a pessimist or an optimist? Whom do you prefer to be around, an optimist or a pessimist? What may be even more convicting….do people prefer to be around you at all? Note that the Paul isn’t saying that all things are good. That’s not reality in this fallen world where we live. No matter our faith, we’ll go through some difficult experiences in this life before we go home to be with the Savior; however, the passage is teaching that God uses the bad in our lives for good. No matter how bad things get, the optimist believes that things will get better. I’ve observed that many people don’t understand optimism. They’re convinced that an optimist is always happy — never sad or discouraged. But that’s not the case. An optimist is one who assesses a situation for what it is (a realist) and if it’s negative, they find a way to see it in a positive light. They truly believe that all things work together for good and that good is just around the corner. What are some other qualities of optimism? Optimists are persistent and not quick to quit, because ministry, work, or life might become difficult. Research indicates that optimists are healthier. Optimists bounce back quicker from setbacks. Optimists tend to have more productive ministries. Optimists try harder, because success is just around the next corner. Optimists are able to better adjust to changes in their environment. All these are great qualities to have and look forward to. So if you’re a pessimist, how might can you look to become more positive? 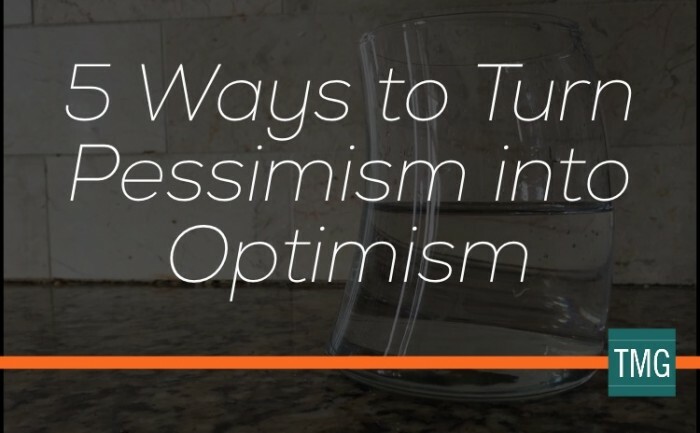 Following are 5 suggestions for how to turn pessimism into optimism. Ask God in His time to transform you into an optimist and convict you of your pessimistic thought patterns. Watch out with whom you are around. Hang out with optimists and not pessimists. Train yourself to repeat this passage every time you find yourself in a difficult situation. Ask your close friends, associates, and family members to call you on it when they observe you being a pessimist. Consider getting a leadership coach to help you accelerate results. Look for positives each day. At the end of each day, take time for a special devotion that focuses on optimism where you look back over your day and identify all the good that God has brought into your life. The next morning you can start the day off remembering (and looking forward to) the good things God has ahead for you.